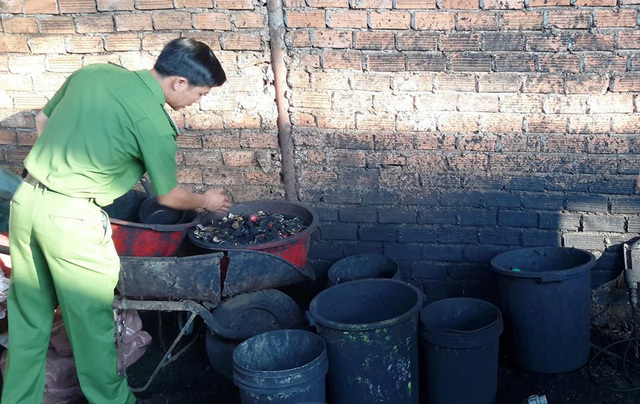 A family-run coffee production establishment in Dak Nong Province in the Central Highlands of Vietnam has been caught red-handed producing coffee from harmful materials. Dak Nong Police said on Tuesday they were finalizing case files to prosecute those involved in the operations of a local facility that produced ‘dirty’ coffee. The facility, owned by Nguyen Thi Loan, was raided by police and food inspectors on Monday afternoon following reports from locals of their suspicious activities. During the raid, authorities discovered tons of finished coffee as well as raw materials used in production, including 35 kilograms of black powder taken from used D batteries and a bucket of blackish water weighing around ten kilograms. According to Loan, her workshop bought rejected coffee beans from large facilities at a cheap price, ground and mixed them with other materials including dirt and rock dust, then used the black powder found inside D batteries to ‘dye’ the mixture to produce finished products. Loan confessed to having run the facility for years and had sold over three tons of ‘coffee’ to the market since the beginning of 2018. At the time of the raid, there was twelve metric tons of the dirty coffee available at Loan’s facility. Police have taken samples of the battery-dyed coffee for lab tests to complete case files for the prosecution of those involved. According to Assoc. Prof. Tran Hong Con, a chemistry expert from the Vietnam National University – Hanoi, the ‘black powder’ found inside D batteries is actually manganese dioxide that makes up the batteries’ core. Manganese dioxide is a highly oxidant compound, and as little as 0.5 milligrams of it mixed in a liter of water is enough to cause manganese poisoning in humans, Con said. In addition, other heavy metals commonly found inside batteries such as lead (Pb), mercury (Hg), zinc (Zn), cadmium (Cd) and arsenic (As) are all extremely toxic elements that can damage one’s brain, kidney, cardiovascular system and fertility if consumed. “Poisoning caused by any of the aforementioned heavy metals can have very adverse health effects, including death in serious cases,” an expert from Vietnam’s National Institute of Nutrition said.